I'm so excited to welcome guest blogger and fellow paddler Matt Hoffman of Grantham, NH. Matt is still happily canoeing even though it's early November. When he's not out exploring New Hampshire's great outdoors, he works as a fine art and adventure photographer. Be sure to check out his incredible photos on his website. For most of us, this is the time of year when we hang up our kayaks and canoes for the season and prepare for winter sports. But the snow hasn't started to fly yet, and there are still good paddling days to be had before the freeze sets in. The key to staying warm and dry this time of year is to find a place to paddle that is not too open and offers lots of shelter from the wind, while still providing plenty of scenery and nooks and crannies to explore. 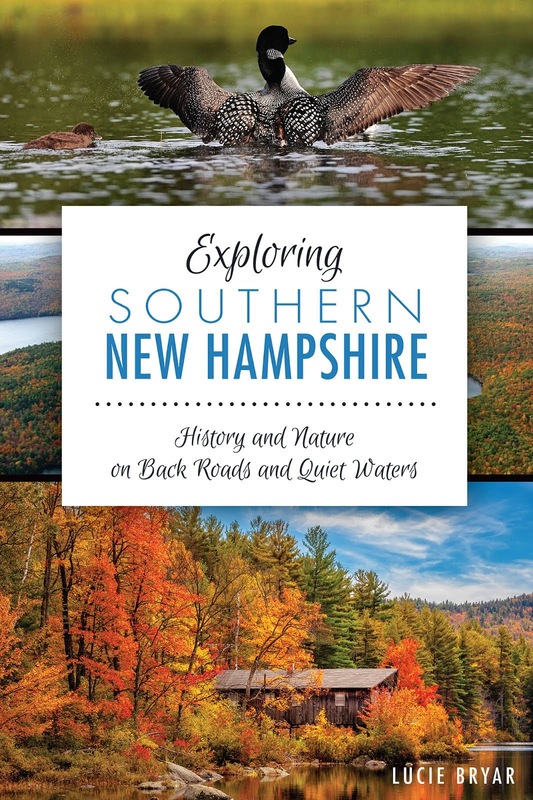 One such place is Pillsbury State Park, located off Route 31, about 10 miles south of Newport, NH. There's a $4 per person entry fee, but that gives you access to a number of trails and four lakes, all easily paddled with only short portages between the latter two. 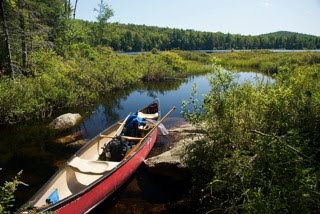 The ranger station is conveniently located at Butterfield Pond, which is a great place to start your paddling adventure. Butterfield Pond is relatively shallow, with protruding rocks and small islands, but these obstacles keep the paddling interesting. There are two campsites on the southern shore of the pond, accessible only to paddlers. Heading east across the pond, a tight squeeze through some large boulders gains you access to May Pond, the largest pond at the park. May Pond is an open water pond, but it offers excellent scenery and great fishing. Hugging the southern shore, you might be treated to wildlife sightings, such as beavers and otters. The northern shore is dotted with campsites. At the far northeast corner of the pond, a small inlet stream is your cue to take out and begin the short 1/4 mile portage to Mill Pond. The smallest of the four ponds, Mill Pond is a wildlife haven. Moose are regularly spotted here and turtles abound. The short paddle across this pond takes you north to the next portage. This portage, marked by a sign, takes you to the 1/8 mile easy trek to North Pond. North Pond is where you will really feel the wildness of the park. There is not one single man-made object visible from this pond. There are two campsites here, one at the put-in and another along the eastern bank. Both are accessible only by hiking in and as a result, they are usually empty. The western side of North Pond is full of coves and inlets that beckon you to paddle as far into them as possible. At the north end of the pond, a small inlet leads to a beaver pond. Exploring here can take a while, and it is a great place to just sit in your kayak and feel at one with nature. From North Pond, a reverse of the above description will take you back to your car. For a shorter paddle with no portages, try exploring just Butterfield and May Ponds. Or, you can drive to Mill Pond, paddle it, and have one short portage to North Pond. There are many options at Pillsbury State Park. This is a great time of year to have a lake or pond all to yourself. While most people have already hung up their kayaks for the season, you can be out enjoying the wilderness as nature intended -- and Pillsbury State Park just might be the perfect spot to do that.